Eating breakfast foods that masquerade as a light lunch can seem like you’re just condensing two meals. But in reality, the centerpiece of brunch is usually the great company, with the food as an added bonus. However, at The Bongo Room, the food comes to the forefront in this vivacious atmosphere. As you step foot through the front door, a bustle of waiting patrons and servers prepare you for a great meal. To the right of the entrance is a lovely coffee bar where you can grab a mug of coffee as you wait your turn to enter the dining room. At peak brunch period, come prepared with a book, ready to wait for at least an hour; however, if you roll out of bed a little later, the wait time can drop to under 20 minutes. Seating in the dining room is elbow to elbow, but the inherently friendly clientele creates a sociable and cozy atmosphere. Before you can do any socializing though, you’ll need hours thinking about what to get. Everything sounds delicious. There is the standard “two eggs any style” option, but the menu delves into so much more exciting territory. The Red Velvet Pancakes, Pumpkin Carrot Cake Flapjacks and Tenderloin of Beef Omelette all looked amazing (but alas could not all fit on the table). This time around, an incredible spread of the BLT Benedict and the Cannoli Hotcakes stole the show. The eggs benedict were like none other. 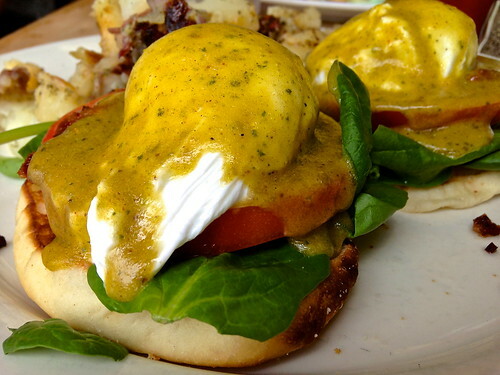 The pesto hollandaise sauce added a lightness and zest to the crisp bacon and orbs of poached eggs. Typically, the English muffin is the least memorable part of eggs benedict because it is dry and bland. However, these English muffins were tender and moist, absorbing all of the wonderful flavors on top of it. The Cannoli Hotcakes complemented this savory dish. 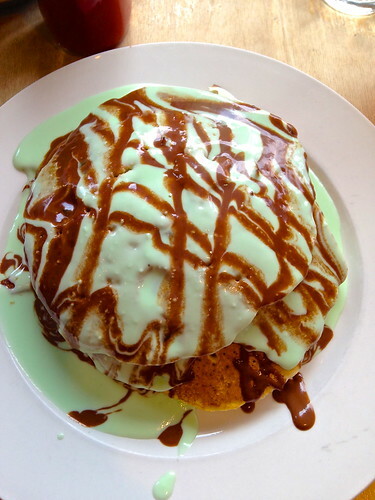 Dinner plate-sized hotcakes, dotted with marsala-soaked cherries, were smothered in a pistachio and chocolate sauce, as all of the wonderful flavors acted as paint to the canvas of the fluffy hotcakes. The Bongo Room’s morning spread can easily dissuade any brunch skeptic. 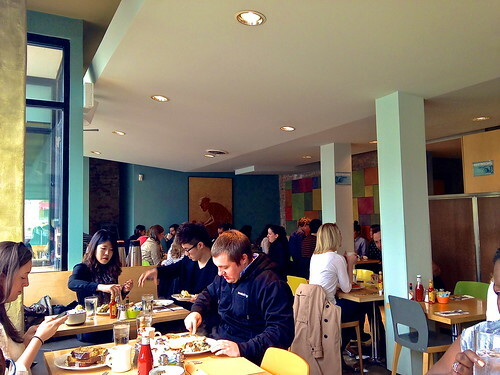 Its food, atmosphere and attractive prices are likely to continue drawing “brunchers” weekend after weekend, so grab your friends and get in line.